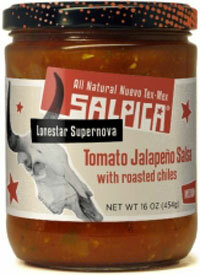 Salpica Tomato Jalapeno Salsa With Roasted Chiles uses fire-roasted tomatoes and fresh garlic, plus invigorating jalapeños and fresh cilantro, this is a recipe for success. Jalapeño rules. It’s the blue ribbon, big-belt-buckle, pepperoni pizza of salsa chiles. And y’all know it’s true. 16oz. Roasted fresh tomato, tomato (tomato, tomato juice, calcium chloride and citric acid), filtered water, fresh onion, fresh garlic, jalapeño, Hatch Valley green chile (green chile, salt, citric acid, calcium chloride), fresh cilantro, tomato paste, salt, Anaheim chile, paprika, citric acid. Product is 100% gluten-free and all natural. Refrigerate after opening and use within a few days.